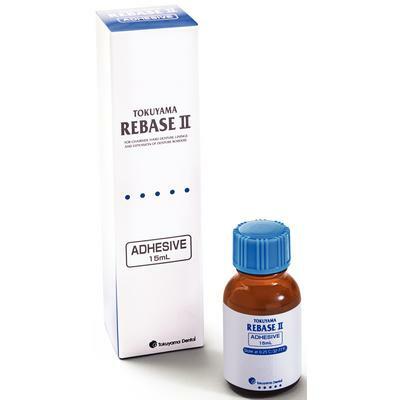 Rebase II Chairside and Laboratory Hard Denture Reline Material – Adhesive 15 ml - Tokuyama America Inc.
REBASE II is a chairside and laboratory hard reline material, for use with complete or partial dentures and partial denture repairs. Without compromising any benefits from its predecessor, Tokuso® Rebase, Tokuyama® Rebase II offers better polishability, lower heat generation for in-mouth curing, higher mechanical strengths, improved handling and less odor/taste. Curing in 4min 30sec intraorally, Rebase II is designed for long-term denture reline applications.